While we are mesmerized by the circus our Dear Leader is giving us (the panem et circenses principle of governing), the busy little Republican termites are gnawing at the floor of this republic, and the bully boyz and girlz in the administration of our Dear Leader are redecorating the public rooms of this republic by demolishing most everything which doesn't benefit the interests of the moneyed elite or of the radical right-wing religionists. Turning Point USA, the student-aimed conservative organization that raises its money by stoking fear among rich conservative donors about the alleged liberalization of college campuses, will host its fourth annual Young Women’s Leadership Summit June 14 through 17. Slated to address the young women attending is a roster packed full of misogynists. And, indeed, there's an anti-feminist for each of my ten fingers, as the linked story tells us. Many are of the "biology-is-destiny-but-only-for-women-psst-your-eggs-are-getting-old" type, others like the variation of "boys-will-be-boys-and-will-harass-girls, " and yet others are of the "feminism-is-cancer" type. It's wonderful to think how such speakers will motivate young conservative women toward leadership! Maybe in the sense of the Aunties in Margaret Atwood's Handmaid's Tale? I listened to Trump's press conference while cleaning behind the bookcases*. I learned that his memory is so good he doesn't need to have any information archived, and I also learned that no previous American president could manage to do anything about the problem of the Korean peninsula, because they weren't focused on it, and even if they were, they didn't have Trump's negotiation skills or the great people he has. I also learned that Trump loves Kim Jong-un**, but he doesn't love Justin Trudeau, and the iconic photograph of the G7 meeting where Angela Merkel appears to scold him is just not real, because he gets on with Merkel very well. And of course I learned that this short summit was a great success. Which it may well have been, at least for North Korea***, given that I didn't catch anything about how the promised denuclearization of the country would be verified. Perhaps that is something for future "hashing-out of details?" And all those pesky human rights violations? Well, the two countries may become more similar over time through a different developmental path, what with the current US practice of separating children from their parents at the southern border, for those who lack proper travel documents. I don't want to be too cynical. 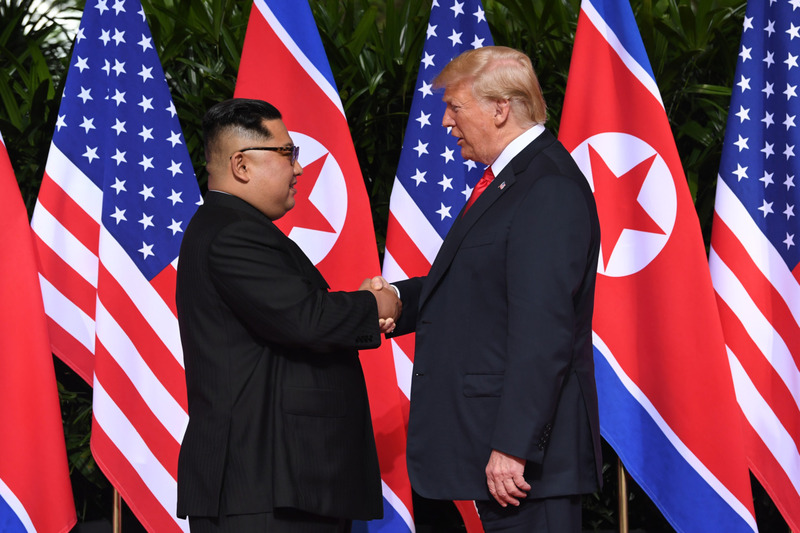 A face-to-face meeting of the two "dictators" is certainly a noteworthy event and could well lead to some easing of the tensions in the two Koreans if competent people continue the needed negotiations. * Yes, I am bonkers. But I'm also getting rid of hundreds of books. The bookcases are tall, not moved for years, because books have the odd habit of multiplying when removed from the shelves and then there's no floor-space to move the cases. I found dog hair behind them and one embroidery I had forgotten I made. ** He loves dictators, warlords and strong men, probably, because he loves adulation and people who wish to keep their heads attached to their necks will adulate the dictators, warlords or strong men who hold the power over them. Trump wants that adulation. He doesn't love democratically elected leaders, because they are all beta men or crooked women and weak. Very weak. *** Even getting the dictator normalized by having him stand next to America's very own dictator-to-be is a victory. And Trump seemed to promise to cease the military training exercises that the US military has been carrying out with the South Koreans. That came as a surprise for many South Koreans and the US military stationed there. The only mentally sound way to read news about Trump is as a form gallows humor. It would be perfect if we were watching the end of the Western liberal coalition from another planet while drinking beer and munching on popcorn.